The hypothalamus is a part of the diencephalon which is located below the thalamus. It creates the floor and the lower parts of lateral walls of the 3rd ventricle. Anatomically, hypothalamus is small in size weighing only 4 g and creating only 3% of the total brain mass, but physiologically there’s barely any action in the body which is not affected by it. Therefore, the functional importance of hypothalamus is disproportionate to its size. The hypothalamus controls the autonomic and endocrine systems at the maximal level and is also associated in some affective or emotional behaviour. Being the main autonomic center of the brain, it’s been regarded as the head ganglion of the autonomic nervous system by Sherrington. Anteriorly: Lamina terminalis (lamina terminalis goes from the optic chiasma to the anterior commissure). Posteriorly Subthalamus. Inferiorly: Structures in the floor of the 3rd ventricle, viz. tuber cinereum, infundibulum and mammillary bodies. (These structures are really the parts of hypothalamus itself.). Medially: Cavity of the 3rd ventricle. Preoptic region-adjoining the lamina terminalis. Supraoptic region-above the optic chiasma. Tuberal region-contains the tuber cinereum, infundibulum and area around it. Mammillary region-contains the mammillary bodies and area around it. The preoptic region is located anterior to the hypothalamus between the optic chiasma and anterior commissure. Anatomically, it belongs to telencephalon but functionally it belongs to hypothalamus. The tuber cinereum is the region bounded caudally by mammillary bodies and rostrally by optic chiasma. The infundibulum attaches the posterior lobe of the hypophysis cerebri with the tuber cinereum. The tuber cinereum around the base of the infundibulum is increased to create a median eminence. The hypothalamus includes numerous cell groups referred to as hypothalamic nuclei. Hypothalamic regions and nuclei in them. Tuberal region Arcuate (infundibular) nucleus. 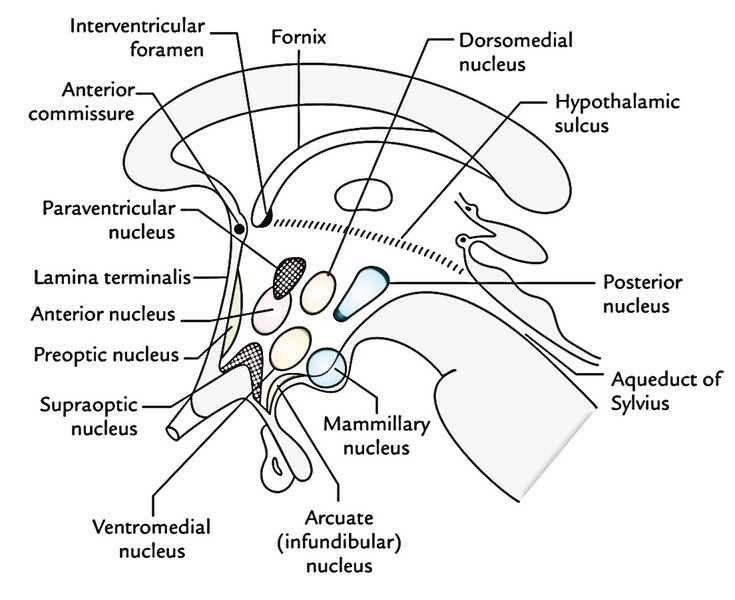 The axons of supraoptic and paraventricular nuclei run in the pituitary stalk to make it to the posterior pituitary (neurohypophysis) and create the hypothalamohypophyseal tract. These axons carry the neurohormones-vasopressin and oxytocin-synthesized in supraoptic nucleus and paraventricular nucleus, respectively, to the posterior pituitary. The axons of other cell groups, example, tuberal nuclei goes into the region of median eminence to deliver their neurosecretory material to the hypothalamohypophyseal portal system of blood vessels to control the secretion of hormones from the anterior pituitary (adenohypophysis). The long axons from thalamus go through the brainstem and spinal cord to synapse together with the preganglionic sympathetic cells in the lateral horns of the thoracic and upper 2 lumbar spinal sections and with the preganglionic parasympathetic cells in the lateral horns of the S2, S3 and S4 spinal sections to create hypothalamospinal tract. Mammillothalamic tract attaches the mammillary body to the anterior nucleus of the thalamus, which in turn projects to the cingulate gyrus. Autonomic control: The anterior part of the hypothala-mus commands the parasympathetic nervous system while posterior part commands the sympathetic nervous system. Endocrine control: Modulates the hormonal secretion of the anterior pituitary by creating the discharging elements or release inhibiting components which in turn control the endocrine actions of the body. Neurosecretion: Secretes neurohormones: oxytocin and vasopressin. Management of food and water consumption: The lateral part of the hypothalamus functions as hunger center while the medial part functions as satiety center. A thirst center in the lateral part modulates water consumption. Emotional expression: Plays an essential part in the manifestation of autonomic emotions like laughing, crying, sweating, or blushing mediated by the integrated action of the ANS and somatic efferent system. Temperature regulation: The anterior portion of the hypothalamus prevents the rise in body temperature while posterior portion boosts heat conservation and heat generation. Biological clock: Controls the cyclic actions of the body (circadian rhythm), viz. sleeping and waking cycle, but itself influenced by diurnal cycles. The circadian rhythm for a lot of body functions is about 24 hours.